Costa Blanca in Spain. Local information about towns that have holiday accommodation available. This page is designed to help you to find links in your search for renting aSpanish property, whether you are looking for a villa or an apartment or just a country finca, in either the Costa Blanca, Costa Dorada or the Costa Calida. Principle towns in these regions are (Costa Blanca) Alicante, Elche, Crevillente, Torrevieja, Javea, Denia, Guardamar, (Costa Calida) Murcia, Mazarron, Cartagena, (Costa Dorada) Salou, Tortosa, Reus. Algorfa Rental Property Near Alicante at Algorfa area of Spain villas and apartments in the village and on the Urbanistion. Cabo Roig enjoys some of the finest beaches on the South Costa Blanca, bathed by the warm calm waters of the Mediterranean Sea..Orihuela Costa, Southern Costa Blanca Cabo Roig stretches into the Mediterranean Sea with it's distinct red clay cliffs that run down to it's golden sandy beaches and intimate rocky coves which are great for snorkeling. Catral is a typical Spanish town, with a population of only 5,500, where the people are happy, friendly and open, inviting visitors to participate in their customs and traditions. Sharing with them the Spanish way of life. Catral is situated Just 15 minutes from the coast and close to Elche's municipal district. Altea is a town of great History with unique blue tiled roofs, which make such a striking contrast to the white walls. The shopping is very good here, whilst Calpe and Benidorm offer excellent beaches and nightlife, restaurants and pubs. Tapas bars are very frequent along the marinas and the cuisine is excellent and very affordable. Gran AlicantGran Alicant beach is about 1.5 kilometer away and is one of the best beaches in the Costa Blanca area with its clean, soft sand. It often wins the blue ribbon award. It has four beach bars if you need a nice cold beer or some food.With in half an hour drive in most directions there are also plenty of golf courses.Water parks, Elche Safari park & horse riding are just some of the activities that are close by. Guardamar Del SeguraGuardamar del Segura Rental Property Near Alicante Spain villas and apartments There are eight beaches in total in Guardamar which extend to almost 14 kilometres. Alicante inland country Rental Property Near to Alicante Spain villas and apartments in the villages and on the Urbanistions. BenitachellBenitachell sits at the head of the Moraira Valley between Teulada and the coast road to Javea. Included in Benitachell's jurisdiction is the area known as Cumbre del Sol that covers the coastal stretch between Moraira and Javea. The 13 million square metres includes National Park areas and a beach set among the cliffs that deserves a visit Benitachell has become a popular place to live all year round. La Mata has learned a few lessons from places like Benidorm, because in this area, you'll find no high-rise skyscrapers or package holiday hotels and also because this local area is orientated towards families and couples, you'll find no night time trouble with lager louts etc. La ZeniaOrihuela Costa La Zenia Rental Property Near Alicante at Orihuela Costa area of SpainVillas and Apartments. Located between theTowns of Cabo Roig and Playa Flamenca is the beautiful Costa BlancaResort of La Zenia. Situated in a district known as the Orihuela Costa, La Zenia is a popular and desirable Holiday location. Punta PrimaPunta Prima may offer one of the most beautiful seafront locations on the Costa Blanca. Calpe A Calpe holiday home is the ideal vacation destination on Spain's Costa Blanca along the Mediterranean Sea. RojalesRojales – A pretty village located on the banks of the Segura river, Rojales has been able to keep its traditional Spanish feel, despite the onslaught of Tourism and property development. Santa PolaSanta Pola is located south of Alicante and its airport between El Altet and La Marina, the area is easily recognised by the huge salt pans. The Jalon Valley (also known as Vall de Pop) is situated just inland from the Coastal Towns of Denia, Javea and Moraira. Javea Villas Apartments Rental Property Near Alicante..Javea is without a doubt one of the prettiest Holiday Resorts on the Costa Blanca in Spain Javea Villas Java Holidays . Moraira Villas Apartments Rental Property Near Alicante. Moraira has become an upmarketResort with none of the high rise hotel and apartment blocks associated with a lot of Spanish Coastal Resorts. There are many good restaurants in Moraira in which to spend a relaxing evening. 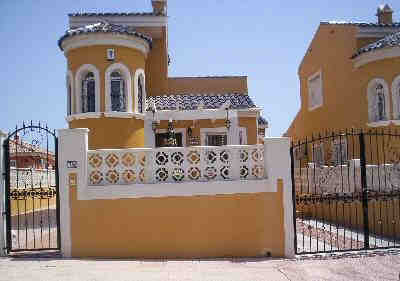 Las Colinas Golf Villamartin Rental Property Near Alicante at Villamartin area of Spain villas and apartments. Pego is surrounded by orange groves. Pego boasts a fabulous climate perfect for growing citrus fruits and rice. Sit and listen to the water cascading in the fountains and soak up the atmosphere as the Town of Pego comes alive at night. The Town is especially popular with the Spanish during the Summer months for its tranquillity, beautiful walks, Marina Port, restaurants and parks together with its kilometres of golden sandy beaches. you wish to rent out ? Beach La Marina June Plenty of Sunshine. This video is of just one of the La Marina Beaches.http://www.ruralspain.co.uk/La-Marina/urbanisation.htm The Urbanisation can be found on a hill above La Marina Village and is far larger than the Village. La Marina is only 20 minutes South of Alicante airport and its fabulous city. The Urbanisation is a very popular area for all nationalities offering an abundance of facilities including bars, shops, restaurants, banks, solicitors, doctors, opticians, dentists, hairdressers, beauticians, sports centres, aqua parks, bowling, a new police station, new civic centre, a gym, vets. Luxury Mt Pleasant Vacation Services Vacation in Mt Pleasant, SC and find luxury vet clinics, dentists, insurance quotes and auto repair.